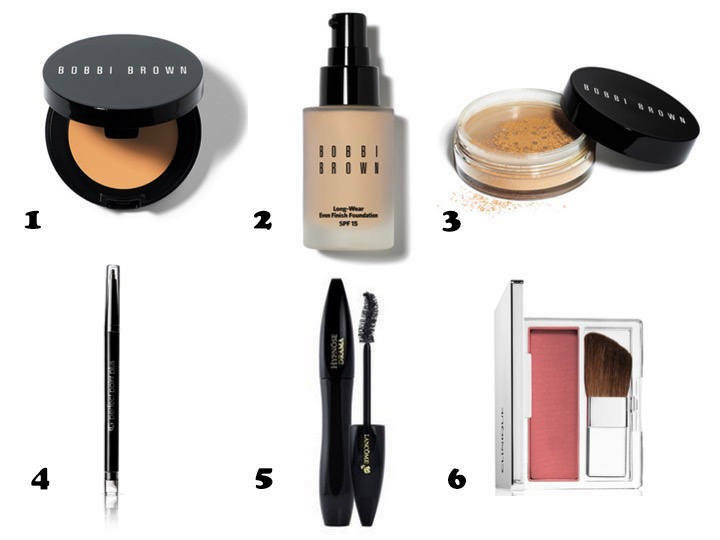 below are my go-to make up products for everyday wear. these six items are all i need on the go. i recently picked up this little miracle worker and now can’t go without it. it’s referred to as “bobbi’s secret to the universe” and i am so thankful to be in on that secret. i use a small amount on my pointer finger to conceal darkness underneath the eye. i stroke from the inner eye and trace my finger under my eye, then blend. it’s the simplest way to freshen up a look. best thing about it? one compact lasts for months and if you put it on in the morning it will still be there in the evening. i prefer light foundations that don’t leave my face feeling sticky and heavy. this foundation is a medium to full, oil free coverage. cheekbone up, then blend all around my face. it provides a natural look that’s long lasting and leaves my skin feeling light and airy. this mineral powder evens out skin tone and leaves a natural finish. it doesn’t cake and never looks masky. some days i skip the the liquid foundation and just use the mineral powder. most days, i use both. i apply the mineral powder all over my face with a face brush after the liquid foundation above. this too, is a very light feeling make up. this eye liner pencil requires no sharpening and gives excellent control. i’ve tried many different brands and types and always come back to easy breezy cover girl. the dark color makes eyes really pop. on the opposite end of the eyeliner there is a smudging tip that can also soften the look. i use black eyeliner on top and bottom. i trace the pencil along my top lash line and lightly trace the bottom outer corners of my lower lash line. i then use the smudge tool on my bottom lash line from the outer eye to the inner eye. the dramatic black color of this mascara is my favorite. i have been using it for years and it is still my go-to. one coat gives my lashes a full and luscious look. two coats and i have big, battable, flirty eyes. i apply two coats of this mascara making sure every lash gets a coat. i use one side of the wand for the first coat then flip it around to use the other side for the second coat. this gives me the best look and most lash coverage. i do this on both my top and bottom lashes. this is another product that i have been using for years. i love it so much that i’m hesitant to even try other brands. (i’m sure there are plenty of amazing ones out there). it’s an oil free, long-wearing blush. i apply using the blush brush provided in the compact stroking from along my cheekbone. for a more natural look, i use my foundation powder brush to blend the blush in. these products are what you will always find in my make-up bag. for a more glam look i spice things up a bit. but for everyday, this is what you will find me using! bobbi brown, lancome and clinique offer a 10-15% discount off your first purchase after joining their mailing club. all offer samples with purchases and other great steals. the samples are a great way to try new products, or as i use them, keep them around for easy travel or store in a jar for overnight guests to use.